A string of Syrian rebel-held towns and villages accepted government rule on Saturday, as insurgent lines collapsed in parts of the southwest under an intense bombardment that the United Nations says has forced 160,000 people to flee. The southwest was an early hotbed of the uprising against President Bashar al-Assad and defeat there would leave rebels with just one remaining stronghold — the area around Idlib province bordering Turkey in the northwest. Rebels met Russian negotiators on Saturday to seek peace terms for Daraa province, where most of their southwest territory is located, but said these failed. Moscow is Assad’s strongest ally and its air power since 2015 has been crucial to his recapture of vast swathes of Syria. Local groups in many towns seized by the army in recent days had negotiated their own surrender deals independently of the main rebel operations rooms, after heavy air raids. Rebels said they had taken back several towns and villages lost to the army earlier in the day, but their overall loss of ground was still significant. State television broadcast footage from inside the towns of Dael and al-Gharbiya, where people were shown chanting pro-Assad slogans. A war monitor and a military media unit run by the government’s ally Hezbollah said numerous other towns and villages had agreed to come back under Assad’s rule. Fierce battles were still ongoing around Daraa city, near the Jordanian border, where the army had repeatedly failed to capture a disused air base, rebels said. The northwestern chunk of Daraa province remains in opposition hands. 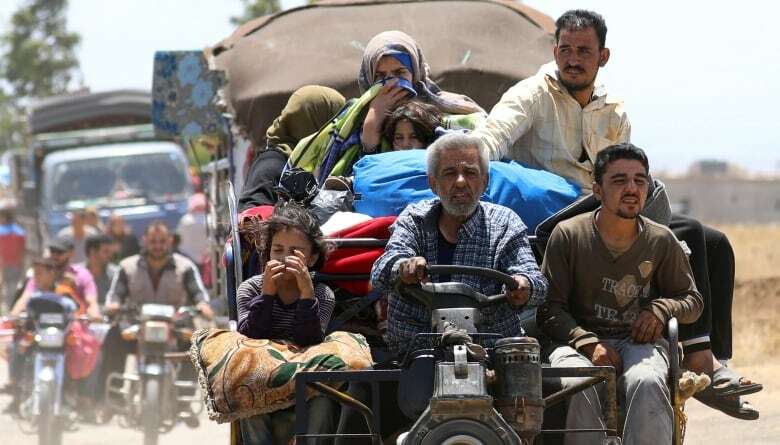 Meanwhile, air raids meanwhile intensified, said the monitor, the Syrian Observatory for Human Rights, as displaced people flocked to the border areas least likely to be hit, and the United Nations warned of a humanitarian catastrophe. After the peace talks failed on Saturday, warplanes launched a new wave of strikes on the rebel-held towns of Bosra al-Sham, al-Nuaima and other areas, the Observatory reported, causing deaths, injuries and damage. 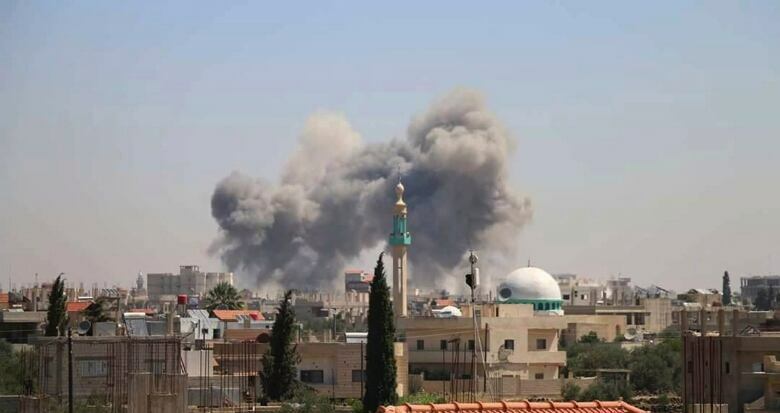 One strike killed at least 10 people, including five children, in the town of al-Sahwa, east of Daraa, it said, raising to 126 the number of civilians killed in the offensive since fighting escalated on June 19. The army’s offensive follows the capitulation of rebel enclaves near Homs and Damascus, including eastern Ghouta, which was recaptured after a scorched-earth assault that killed over 1,000 civilians and laid waste to several towns. Warfare in the southwest could risk a further escalation because of its proximity to Israel. The Israelis have already targeted Iran-backed militias fighting on Assad’s side, which they have vowed to keep far from their country’s borders. The government’s offensive so far has focused on Daraa province, which borders Jordan, but not Quneitra province abutting the Israeli-occupied Golan Heights. The entire southwest is part of a “de-escalation zone” agreed last year by Russia, the United States and Jordan. Despite Washington’s threats that it would respond to breaches of that arrangement, it has shown no sign of doing so, and the opposition’s top negotiator on Thursday accused it of having struck a “malicious deal” to stay silent. Late on Saturday, the Jordanian government said the army had started delivering humanitarian aid to thousands who had taken shelter across the frontier in rebel-held Syria. At the meetings with Russia, rebel negotiators sought to agree a deal for all of Daraa province to come back under government sovereignty, but without the army or police entering the area, an insurgent spokesperson said. But the talks, in the town of Bosra al-Sham, whose Roman citadel is listed as a UNESCO world heritage site, collapsed as the insurgents rejected proposed terms for their surrender, a rebel spokesperson said.